I have been using OneNote diligently for the last week. And this time I have come across several features of one note that I find are superior to Evernote and several items where Evernote clearly takes Microsoft out to the proverbial woodshed. One of these days, a smart software developer is going to develop software, specifically the way I want to work. Until then, I will be doomed to live the life of a typical software user who has to take the good with the bad. Being able to print directly into OneNote was a feature that I thought I would not use. To my surprise, I found it to be very helpful. For example, I printed PDF files into OneNote and then use the text editor to overlay notes on top of the PDF pages. Yes, I can do this with Acrobat but the whole point is having all my notes and information in one place. I placed comments on PDFs of trail hikes where I wanted to remember information about our past hikes or stopping points. I was never able to do this in Evernote as cleanly as I can in OneNote. I really like how one note lays out its search process. You can restrict your searches down to notebooks, section groups, sections or pages. I find this feature to be very helpful as I lay out my notebooks and sections in a very organized manner and generally know roughly where the content is that I am looking for. This does reduce extraneous results that tend to cloud my searches. With the good, comes the bad. OneNote has some drawbacks where Evernote has a very clear advantage. First off, Evernote’s mobile applications are vastly superior to Microsoft’s. You can encrypt sections in OneNote, and all notes in that section will be encrypted on the desktop application. No encrypted notes, sections, are accessible via the mobile apps made by Microsoft. Evernote support’s encryption inside of a note on their mobile platforms. This is a key feature that I miss greatly. I do not understand how Microsoft can make such a major mistake in missing the encryption components of their mobile application. This will hurt their user adoption as people become more security conscious. Another area that needs substantial improvement in one note is its synchronization process. Whenever I make a change in any of my Evernote enabled devices, it seems that all my other devices have that update within moments. My desktop automatically syncs every 30 minutes in Evernote but OneNote only seems to sync when you open the application. So you are left with the choice of leaving it open all the time or waiting for to catch up when you first open the app. I have also had one experience where a note did not make it to the cloud when I closed OneNote down a little too quickly. I never experienced this problem with Evernote. The entire synchronization process with OneNote needs to be rethought a little. It uses Microsoft’s Sky Drive to hold notebooks, which is a good process, but the applications do not really seem to be that synchronization aware as-in they do not synchronize aggressively when changes occur. 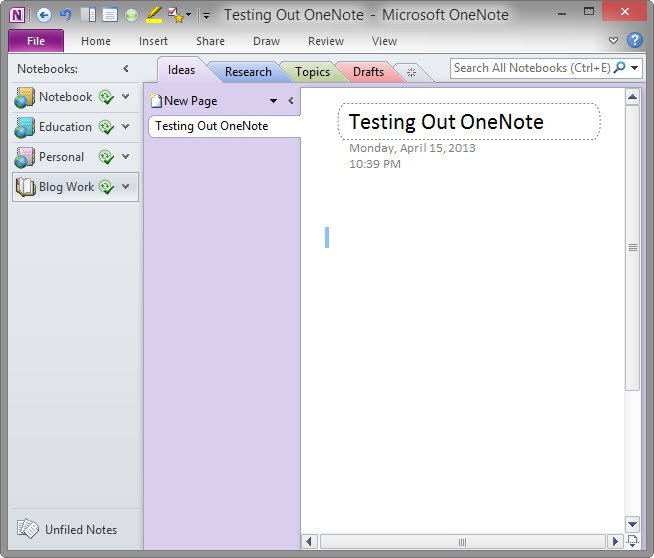 I was able to create, intentionally, note conflicts in OneNote. I think Evernote’s conflict reconciliation process is superior to Microsoft’s. Evernote has a superior tagging process as compared to OneNote. Not only is their general tagging process better but the way that you can search and organize by tag is superior in both the desktop and mobile applications. OneNote seems to be a little bit more reliant on your notebook, section group, section, and note titles for its organization. It does support tagging, but tagging appears to be not a core focus of its notes organization. Overall my assessment after week is that both applications are very good at what they do. I think OneNote has more application polish than Evernote but Evernote has a very clear lead in the mobile platform and support for their product in other applications. The lack of support of OneNote and other applications never really affected me as I do most of my note transfer through copy and paste. I have never been one to do much of send to this or send to that outside of printing. For now, I am going to stick with OneNote and give it at least one full month before I make any final decisions. Why is it that the Amazon Kindle Fire does not have a Microsoft OneNote App? The Android OS has one, but Microsoft has not created a version for the Kindle Fire line of Android tablets. I like my Kindle, but sometimes it is frustrating that I cannot load all Android Apps on it. note how they create post headlines to grab people to open the links. about everything’ve written. In my opinion, it would make your website a little bit more interesting. Thanks for the comments. I am certainly not as creative as I should be, but I will take your comments to heart. I know that I can improve in both areas. I find the Print to OneNote feature to be a bit finicky. Sometimes it works. Sometimes it doesn’t. Are you finding the same? So far, I have not had any troubles with the Print to OneNote feature. I have only used for about 8-10 documents to date, but they have all entered OneNote cleanly. I find the scroll speed to be slower than what I like but have not experienced any garbled text of improper layouts.